The kit I received to test was the standard system and came in a moulded plastic travel/storage case. The contents consisted of a multi angle knife clamp with angle selector, three finger grooved sharpening hones, three guide rods, a 1fl oz. (29.6ml) bottle of honing oil, a couple of spare assembly screws and a pedestal mount. The hones supplied in the standard kit are fine 600, medium 280 and coarse 120. Also available are hones which are extra coarse, ultra fine and a triangular shaped hone suitable for the bevelled side of serrated blades. 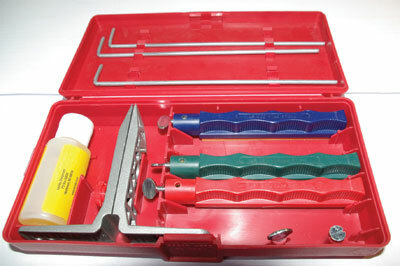 The storage case has the capacity to hold an additional two hones and guide rods. Lansky also make similar sets containing diamond hones and Arkansas hones. The clamp allows for the selection of four angles, giving 17, 20, 25 and 30°. The angles are respectively suitable for artist's knives, kitchen/paring knives, pocket/hunting knives and chopping/heavy cutting knives. The use of the jigs makes it possible to achieve a consistent angle throughout the sharpening process on both sides of the blade. 1. Attach the knife blade to the clamp. The clamp has a recess at the front which makes lining up smaller blades a little quicker. The front screw is loosened, the blade inserted with the back to the rear of the guide, the front screw tightened first followed by the back thumb screw. 2. Assemble the hone. Place a guide rod through each hone to be used. I found this most easy to achieve by laying both items flat on a work surface. Line the rod and hone straight and flat and tighten the thumbscrew. 3. Sharpening the knife. Hold the clamp in one hand - I found the pedestal mount makes the clamp easier to hold, rather than just holding the clamp directly in my hand - and selecting your hone, insert the guide rod into the selected angle hole of your choice and starting at the handle end of the blade make strokes with the hone, working towards the clamp - work along towards the point of the blade. Apply only enough pressure to make the stone work and when finished turn the knife over and repeat the process. Start with the coarse hone, then the medium and finish with the fine hone. If the hone starts to skid or fails to bite use some honing oil and wipe the hone clean. The sharpening system is designed as an effective way to sharpen sporting, hobby and household knives. The hones are colour coded for ease of selection in use. The system takes the guesswork out of sharpening and makes for a more consistent sharpening stroke. The maximum length of blade I could sharpen without it flexing was around 150mm (6in). I was surprised how quick and easy the system was to set up and use. 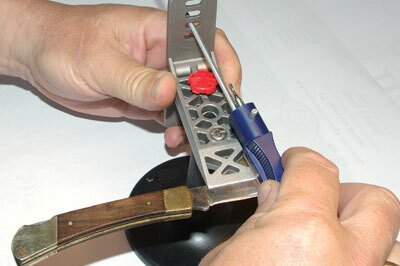 The sharpening system is designed as an effective way to sharpen a variety of knives. The use of the jigs makes it possible to achieve a consistent angle throughout the sharpening process on both sides of the blade. Like most tools the system takes a little practice to become familiar with the set up and use but this is only a matter of a few minutes. Knife sharpening is potentially dangerous. The sharpening system can't hurt you but careless use of the hone relative to the knife blade can. The hone by its nature must run over the knife blade and as you are holding the hone, by definition your fingers are near the newly sharpened blade. Do take care.